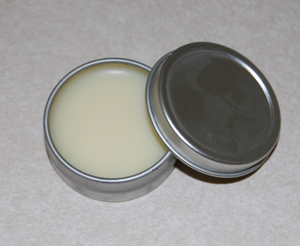 Lip balms are extremely useful for healing dry, chapped lips. They have a waxy texture and tend to lock moisture in the lips to avoid dryness. Use of lip balms is highly recommended in colder climates to avoid exposure to dry air. Most commercially prepared lip balms, however, usually contain additives. Thus, you can easily make use of lip balm recipes at home with the help of natural ingredients like coconut oil, olive oil, jojoba oil, glycerin, cocoa butter, cosmetic grade beeswax, etc. Essential oils like that of lavender, rosemary, peppermint, comfrey, lemon, grapefruit, or camphor may also be used. To add color, you can mix chunks of colored lipsticks, natural colorants, or beetroot juice in it. After preparing the recipe, you can store it in a lip balm jar or tube. • Melt three teaspoons of grated beeswax and five teaspoons of jojoba oil or castor oil in a microwave or double boiler (placing a bowl in a pot filled with boiling water). Next, mix a teaspoon of honey after removing from heat. Finally, pour this lip balm in a container after about 20-30 minutes. • Combine two parts of sweet almond oil, one part of beeswax pearls, 1-2 drops of wheat germ oil and heat the mixture until it thick and smooth. Finally, add a few drops of rosemary or any other essential oil in it and stir thoroughly. Do not freeze; let it cool at room temperature. Besides, you can combine two tablespoons of beeswax and one tablespoon of coconut oil. To improve its smell and flavor, you can add strawberry extract in it after heating. • Another simple way to prepare your own lip balm at home involves melting two tablespoons of grated beeswax and three tablespoons of sweet almond oil, and finally adding two to three drops of vanilla oil in the recipe. You can also mix a few drops of an essential oil of your choice or just a tablespoon of honey. • You can prepare a chocolate lip gloss by heating one teaspoon each of coconut oil, sweet almond oil, and cocoa butter, one to two drops of peppermint extract, 3-4 drops of vitamin E oil, and a few chocolate chips in a double boiler over medium to low heat. Allow it to cool for about an hour and then pour in small containers. You may store this lip gloss in a refrigerator if it is melting at room temperature. Check out this video showing how to prepare organic lip balm at home. • Those who love to experiment by adding more ingredients can prepare a moisturizing lip balm by heating a combination of two ounces each of beeswax, shea butter, jojoba oil, and grapeseed oil. Finally, add two teaspoons of tangerine, lime or sweet orange essential oil. You can use some other natural flavoring oil as well. • When dealing with cold sores, prepare a balm by heating half an ounce of beeswax, and one oz each of almond oil, avocado oil, and emu oil. Stir the mixture well. Next, add a quarter ounce of aloe vera gel in it and remove from heat. Finally, mix six drops of lavender essential oil, three drops of lime essential oil, and two drops of tea tree oil in it. Allow it to cool slightly and then transfer it in a container. Allow it to cool at room temperature. In case the lip balm is too hard, add more oil in the mixture. If it is too soft then mix more beeswax in it. These lip balms can be used for a few months; adding vitamin E oil helps preserve the recipe for longer. However, if your lip balm changes its color or odor over a period of time, it is better to discard it. • You can make a chocolate balm by melting three tablespoons of cocoa butter, four to five semisweet chocolate chips, and the contents of a vitamin E capsule. Stir the mixture and place it in the refrigerator until it becomes thick and solid. • Heat half a teaspoon each of melted candle wax, shea butter, honey, two teaspoons of olive oil, and one vitamin E capsule in a double boiler. Stir well and then store it in a lip balm tin or container. • You may replace beeswax with petroleum jelly in most lip balm recipes. For the recipe that has no beeswax is it ok to put candle wax on your lips? Thank you for the wonderful tutorial and recipe’s. I can hardly wait to try them.